The city of dreaming spires... whether you're looking upwards or climbing up to look down, Oxford, nestled in the flat bottom of the Thames Valley, has a superb skyline charting the history of the city. As you come in from East Oxford, you first notice Magdalen College chapel. CS Lewis was a fellow here, and famously became a Christian here, giving the chapel an extra resonance for those who like his work. 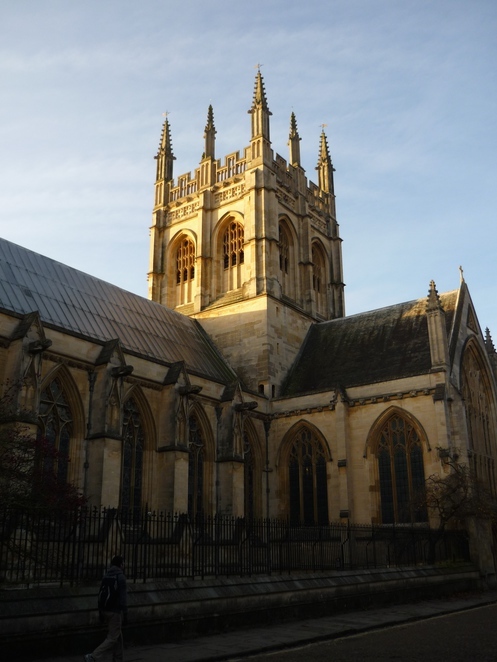 The tower isn't open to to the public, but it is noticeable from afar, and on Ascension day morning the choir famously sings in the dawn from standing on the top, which is a great event to attend too. Ascension day is also marked with rooftop singing at Merton College, just a stone's throw away. Their tower is even higher than Magdalen's, dating back to the fourteenth century. It's not open to the public, but is visible from much of the city due to its height. If you do ever get a chance to go up, there are amazing views of the whole city from the top. The tall spire you can see in the centre of the photo is St Mary the Virgin, the university church. One of the most distinctive and tall spires in the city, it's visible from all around the edges of Oxford. Within the city it looms large, sitting prominently on the high street. With regular services, and special guest preachers and lecturers, as well as concerts, and fabulous architecture, it's a great place to visit in its own right. Tours are taken up the tower, and the views are incredible. As you continue through the city, you'll spot interesting towers and spires all around you. Some are churches, some are college chapels, and some no longer have their religious or civic building attached, but stand as memorials to Oxford's long history. At a crossroads in the centre of town is Carfax tower. This fourteenth century tower remains, although its attendant church was demolished to make room for wider roads. You can climb the tower's 99 steps and get a good view over central Oxford. The tower is also well-known for its extraordinary 'quarter-boys', the mechanical system which chimes the quarter hour throughout the day. With so many church bells, it's hard to be late in Oxford! Can you see the shoes hanging from the cables in the picture above? Some people have claimed such things are markers of gang culture. Keeping your eyes open and paying attention to your surroundings is always going to lead you to something interesting. The final tower on this tour is St Michael's Northgate, on Cornmarket. Oxford was originally a walled city, and elements of this remain in the place names. Northgate marks the northern entrance to the old city, and probably the oldest tower in Oxford, surviving from around 1050. As with Carfax, the rest of the original church is gone, but a newer one has taken its place. You can climb the tower, visiting a treasury and prison cell along the way. At Christmas they also have a great charity card sale. As it's a church, there are also daily services and a great choir. So, put on your walking shoes, and spend some time climbing stairs and pounding the streets for some great views, great exercise, and great exposure to Oxford's past. I love Oxford's impressive historic architecture. What an interesting article. Great shot of St Mary's too.